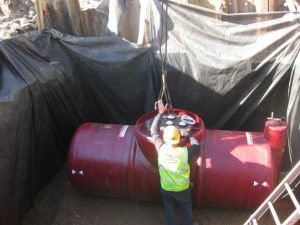 New Underground Storage Tank Operator Training Required by the State and Federal Regulations. Recent New York State Department of Environmental Conservation (DEC) revisions to the PBS and CBS regulations have resulted in the DEC issuing DER-40, Operator Training. This program policy summarizes the requirements for training Underground Storage Tank (UST) operators as required by the State and Federal regulations. Establishes Class A and B operators who have primary and day-to-day responsibility, respectively, for UST systems. The operators must be identified in the facility registration. To become a Class A or B operator, a person must pass a required exam. DEC has developed the required certification exam for Class A and B operators, which can be taken online or in person. The DER-40 includes detailed guidance on the exam administration process. Class C operators are responsible for responding in an emergency, and can be trained and tested under the direction of an authorized Class A or B operator. The training must be documented. If a facility is found to be in significant noncompliance, DEC will require the Class A or B operator to be reauthorized or replaced. DEC has issued a Training Guide for Class A and B UST Operators which provides an overview of the UST operator certification to help prepare individuals to take the Class A/B exams. The program policy and training guide can be found on DEC’s website at: www.dec.ny.gov/regulations/2387.html.